In this session, Klein centers the discussion on the empirical phenomenon of all the theory previously discussed; vertically integration of companies, authority, commands and changes of a supposedly former well-defined hierarchy to a more flatter one. He talks about the changes in the world and Economy, as well as how the same economic laws can be used to understand the markets and its fluctuations. While people say that the internet and the technology are the drivers of a whole different kind of economy that’s radically different in structure and nature from economies than came before, Klein argues that we need to be more skeptical when analyzing those statements but it may be some truth based on the research he presents. It’s very easy to say that everything is different now”. Lastly, he talks about authority and planning within a firm, which he explains it’s challenging to Austrian economists. A firm is not merely a taxis, Klein states, but it is in some way a spontaneous order from a Hayekian perspective. 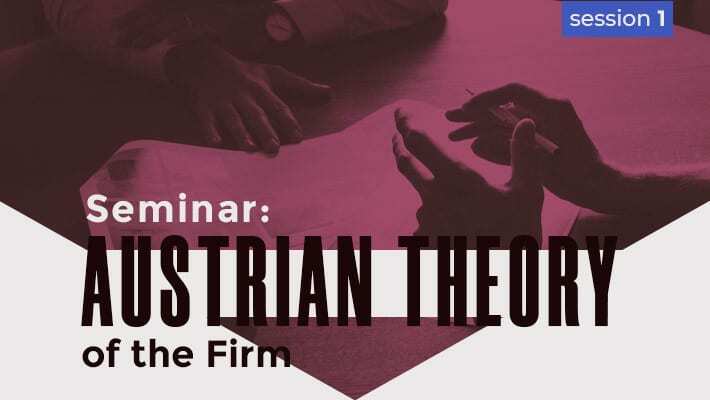 Want to know more about Austrian Theory of Firm? Watch the whole collection!